Are you kidden me? Eight tyees on the last trip, heaps of springs around, and coho snapping at everything down along the Pillar Jalun area. 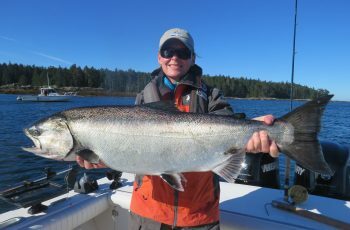 Yes we are approaching the end of the season, but some great fishing is happening here at Langara. One of the only places on the coast where you can grab tyees from early May til mid September! Other areas are finished, charter boats tied to the docks, but here we keep on fishing and catching, what a nice way to end the summer. Our largest fish of the trip was taken on Boat 4, yes the Scream Machine finally grabbed one, lucky angler Warren Jeffery, a 47.5 beauty. Warren has had a 61 in his past which he mounted, lucky guide Tommy from next door, cracked the fish off Bird Rock. That is ancient history though, and we release these monsters now. This fish came at the end of our day. 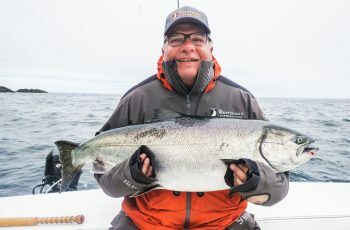 We had started off in the Bowl and had a great tide, hammering the tar out of the 20 lbers, so much fun slow trolling in all that bait along the kelp. We were not the only boat doing well, young Buckshot had a bucket as well and Bryce called the bite once he had his tote full. Conman roared in, as the kelp blew the area out, and i thought he would snap. Close to it, but Connelly snuck four chins out of the bowl as well, and held er together with his repeat customer Anthony Lawler. 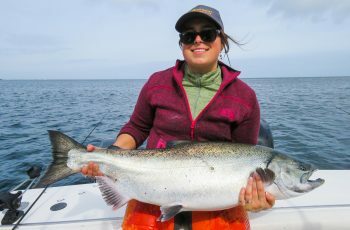 We had enough, the tide slowed so at 5pm we stormed off to the Cabbage Patch for some Coho action. Second pass Warren had a very solid thump, the rigger arm made a very load clunking sound and his reel absolutely screamed , rod buckled, and full panic set in with myself leading the way. it was a cluster you know what in there, 30 boats milling every which way in the tide, coho biting, kelp all around, combat fishing. Our fish screamed easily 150 yards in one massive run, lucky Bud was awake and jogged his Predator to the Starboard and moved off. The Hippa then came back on us, almost like a sea lion, and charged under the boat and a 100 yards towards the patch. talk about slack line, Warren looked like he was grinding coffee forever, that islander reel was cranking. This fish never did show to to the net job, and when she was done, we easily slipped the bag around her, very exhausted, the fish and Warren. Next step the HIPPAQUARIUM! We loaded fish and water in the massive revival tote and that monster had a nice bath and a deserved rest. We measured her out at 43.25 long by 29.5 girth….we divide by 800 here, the REAL formula! 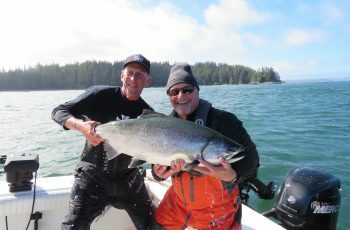 Next some pictures and a talk with Warren explaining why we release all large salmon over 40 lbs if possible and he was onside with that. No excuse ever to crack one of these monsters as long as the fish is healthy. A gill hooked fish will die, other than that, give these monsters a break. One thing for sure, they die when you crack em. Trust me, no feeling in the angling world than watching a giant hippa swim out of your hands and back along the kelp, where she gets her bearings, and gathers herself for the swim home to her river, where she will live out her final days laying her eggs. it feels so bad cleaning these fish at the table, seeing with your own eyes 2000 large red eggs, sitting there in the gut bucket, what a waste. So thanks to Warren she is on her way, as was a 38 today, landed and released by Ron Carter…with skipper Hans I am told, no details but thank you as well. Ron Barkley grabbed a 36 on day one, Brad Shaigec cracked a 39 in a self guided unit, Cory Poggemoeller had a 32, James Harris angled a 32 as well. Conman wanted me to say thanks to Anthony Lawler for releasing a large halibut over 250 lbs, I think Matt and Anthony tagged teamed the fish, as this fish was a battle, and they posted some pics on face book of the beast at the boat. Halibut fishing was decent, lots of the guys that went grabbed 30 to 50 lb fish. Peggy Zorro and Eugene Zoro had a nice trip with Jordie, and I see they had a nice catch of fish and lots of stories to share, nice to see them enjoying the area, the whales, the sunshine, and theyre fav. guide. Rain has set in here tonight, wet morning ahead. Had some humour in the bowl this afternoon, to help pass the time between fish. Had a self guided unit from a local lodge troll with the tide, in tight quarters between 30 boats, head down and almost ram me at 5 knots. First time I have ever used my horn. Felt like the city. The character was two feet off my bow sideways and punched it, barely escaping a 30 foot whaler weighing 8500 lbs, then slid down the tide and gooned a blue boat. I could only shake my head, and the dude snapped, had a meltdown, warned me not to EVER shake my head. That is old school, a high pitched verbal beat down in the bowl ha ha. I think the guy is still trolling towards Cape Knox, look out! A reminder, if the boats are rod tip to rod tip bucking the current, you might want to troll or mooch on the outside traveling with the tide. Starboard rod to the beach, coast wide. Will save you a world of problems and embarrassment. just something to consider in tight spots and combat situations. 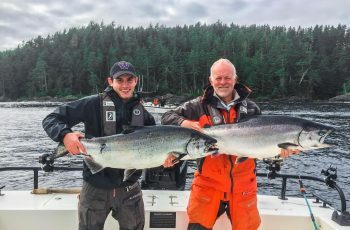 A big thank you to Dan Hamhuis and Manny Malholtra , who fished with me one day during the FFK event. Two of the funniest characters you could guide, and yes Dan, you are getting that massage! Manny had a nice 29.4 for 6th in the derby, but our stories and laughs far out weighed the fishing. Also a big congrats. 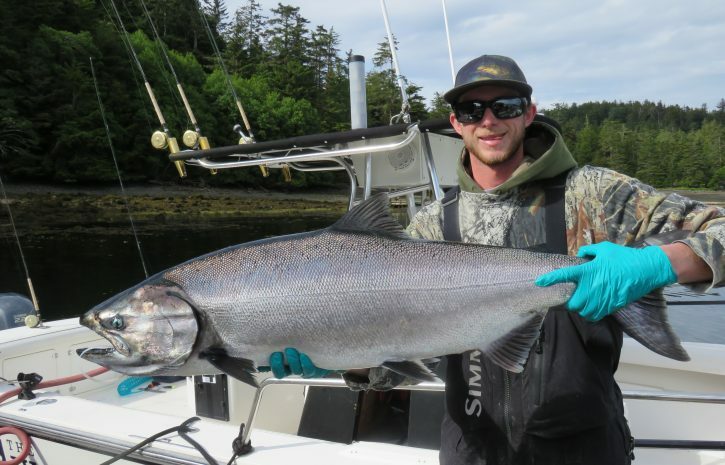 to Kenny Tsang and his guided 41.3 from the bowl, fishing far to close to my secret spot, what a nice win Ken. With two hours left in the day, you are the Man of the year Thermos. Also all-star Wade, or Whitey as he is known, showed up and fished hard, and always produces, Wade drove in from Cranbrook, no doubt sleeping in his Gremelin eating donuts just to help us, thanks Whitey. of course Mitchell showed up for an ego fluff, again, you might have not caught the big one, but hey, a Stanley Cup not so bad! Great blog guys well done and I and Brent had a great time.